We hope the following bird watching tips will enhance your enjoyment of birding and the outdoors. 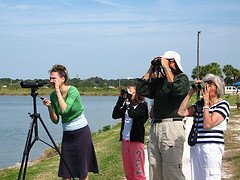 Bird watching is an activity which can be enjoyed by people of all ages, in any habitat and at any time of the year. Below you'll find some bird watching tips for beginners which were helpful to me when I was just a fledgling birder myself. If you don't have a pair of binoculars or are thinking of retiring your old pair, review this article on choosing the best bird watching binoculars before making a purchase. If you already have a pair of bins that you enjoy using, then great! Below are some bird watching tips when using binoculars. First, adjust the barrels of your binoculars so they fit your eye spacing. Spread the barrels as far wide as they will go. Bring them up to your eyes, facing the sign, and press the barrels together until the two images converge into one. Now they should fit your eyes comfortably. Next, turn the center focus wheel as far to the right as you can and the individual focus (usually right eyepiece) as far to the left as it will go. Both eyepieces should be out of focus now. Facing the sign with eyes shut, bring the binoculars up to your eyes. With your left eye open, turn the center focus wheel until the lettering comes into sharp focus. To be sure you have the sharpest possible focus, pass the sharpest point and then back up to find it again. Now, shut your left eye and with your right eye open, turn the right eyepiece (individual focus wheel) clockwise, bringing the lettering into focus. Again, pass the point of sharp focus and then back up to where the lettering is sharpest. Open both eyes, and the binoculars will be in perfect focus. Note the right eyepiece setting, as it is now adjusted for your eyes. This way, if it is accidentally moved you can quickly turn it back to your eye setting. Protect your binoculars when not using them. Clean the lenses before each outing. The last thing you need is a big smudge or scratch on your lens when trying to ID that life bird! Trying to locate a bird in a dense patch of trees or shrubs can be difficult with binoculars, especially for beginners. Use your naked eyes and ears first. Look for movement and focus on sound. Step back, keep your head still, and let your eyes relax. It will be much easier for your eyes to detect any movement when you are still and not moving your head around. Find the bird with your eyes first, then while focusing on the bird, bring your binoculars up to your eyes to get a better look. Don't look down at your binoculars when doing this. Keep your eye on the bird. Also note any distinguishing points of reference that will help you find the bird with your binoculars. For example, if the bird is next to branch that curves in a unique way or near a leaf that looks different than the others. This way when you bring the binoculars up to your eyes and don't have the bird in view immediately, you can use these points of reference to guide you in the right direction. It's much easier to find a bird with your eyes first than trying with 8x or higher magnification. For example, when you're trying to find someone in a crowd, it's a lot easier when you have a wider field of view. Find the bird first, then use the binoculars to see details. For example, if a bird is in a tree, look at the branch its on with your eyes first and anything unique that would be easy to find first with binoculars, then you can follow the branch over while looking through your binoculars to find the bird. Practice finding birds with your binoculars in your backyard. This way when the pressure is on in the field it will be a lot easier to find that fast-moving warbler flitting branch to branch. When you just spotted that Orange-breasted Honeyeater for the first time and your birding pal quietly shouts, "Where?!" Don't reply, "Up there, in the tree!" (when you're in a forest) or "Just to the right of the clouds!" (on a cloudy day) or "Out there flying over the water!" (on a boat in the ocean). You need to be as specific as you can. First use large points of reference, then get more detailed, i.e., "Do you see the large maple tree closest to us? Go 2 trees down to the right, and the bird is in the one with the leaves that are starting to turn yellow near the bottom." Then, once the person is looking at the right object, use the clock system. In a tree 12 o'clock would be the top, 6 o'clock the bottom, 9 o'clock middle left of center, 3 o'clock middle right of center. 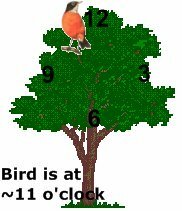 So you could say, "The bird is sitting on a branch at about 2 o'clock, half-way out from the center of the tree. It's on the thickest branch that curls downward near the tip". Practice when you're birding alone. How would you tell someone the location of a bird you are watching? Don't get frustrated when someone doesn't understand your directions. Keep giving them different points of reference until they catch on. Bring a small notebook with you on your bird watching outings. Take notes to help you remember how you identified a bird. Some people keep a life list of all the birds they have seen since they started bird watching. When listing make note of the species but also the date, specific location, habitat, male or female and behaviors (feeding young, catching insects, preening, etc.). Be as detailed as you can. It's fun to look back on these notes and remember when you were just a fledgling of a birder. If kept in an organized manner, your field notes and observations can produce useful scientific data. For example, you can contribute your sightings to programs such as the Ebird program at Cornell Lab of Ornithology. We hope these bird watching tips were helpful to you. Remember to pass on your enthusiasm to others, especially young people, and always follow your Bird Watching Bliss!